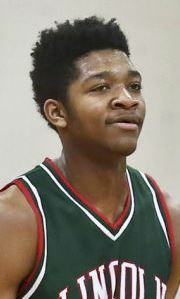 LINCOLN — Lincoln High School senior center Jermaine Hamlin scored 29 points, including two free throws with under a second to go in overtime, to lead the Railers to a 69-67 victory over Bloomington. The 6-foot-10 Hamlin was 11 of 15 from the field and made 7 of 9 free throws as the Railers, ranked sixth in Class 3A, improved to 23-2. Hamlin also grabbed 11 rebounds to lead Lincoln to a 24-23 edge on the boards. Kaden Froebe added 14 points, five rebounds and three assists for the Railers, while Dylan Singleton scored 12 points. BHS (15-11) was topped by 19 points from Caleb Donaldson. Nate Duckworth added 17 and Landon Moore 15. Griffin Moore led the Raiders in rebounds with eight. Lincoln shot 58 percent from the field (28 of 48) to 49 percent for BHS (25 of 51). Lincoln was 9 of 12 at the free-throw line and the Raiders sank 11 of 17. As for guarding Hamlin, Mosley said, "We had to be able to guard the post and make plays."